Settlers burn lands in Hebron, and Israeli forces bulldozed lands in Salfit. 22 \ 5 \ 2014, 'Avi Gal' and 'Mitzpe Yair' settlements‘ settlers burned wheat and barley farms, that belong to the citizen Khaled Moussa al-Najjar, in Aqoyues area east of Yatta, south of Hebron in the West Bank. 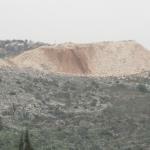 In Salfit, occupation forces bulldozed farm lands in Thahr Sobh area south of Kafr El Deik town in Salfit district. Omar Mokadi, the public relations coordinator in the district, said that a bulldozer accompanied with two military vehicles and a group of settlers started to bulldoze the region until the people of Thahr Sobh came and forced the occupation forces to stop. He added that the region is close to "Ali Zahav" settlement; and that the region is an archaeological area that is exposed to confiscation attempts by Israeli army and settlers since the eighties.